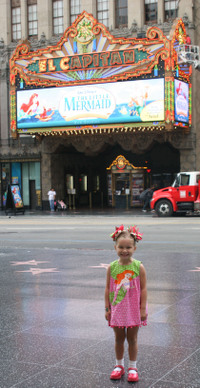 Scarlet and I had the most fun ever on a recent trip to the El Capitan Theater to see The Little Mermaid! Even though we have both seen the movie a MILLION times, it was so fun to see it on the big screen at such a gorgeous theater. AWESOME!! I'm DYING for it to come out on DVD next week. "We've got a hot cru-sta-ce-an band!" What a beautiful theater! 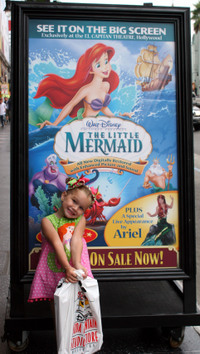 And, oh that little Scarlet. 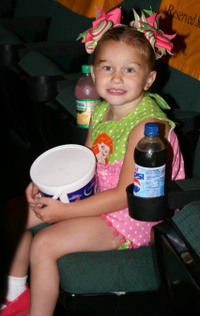 She is one of the most beautiful little girls I've ever seen. She always makes me smile with her, ahem, enthusiasm for being photographed. :)She just looks so very happy. Your love for her shows through her own eyes. Ack! And look at that dress. lol I missed that the first go-around. You are something else. 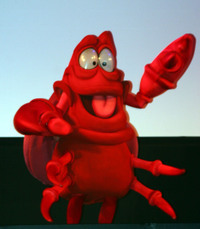 Oh goodness - I LOVE this movie! 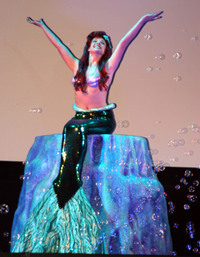 I seriously plan on being at Walmart first thing Tuesday morning to pick up our copy of The Little Mermaid - can't wait! And I am constantly in awe of your projects Gillian - you are constantly blowing me away. oh how i wish that we had something like that show up around here. bella would looove it!